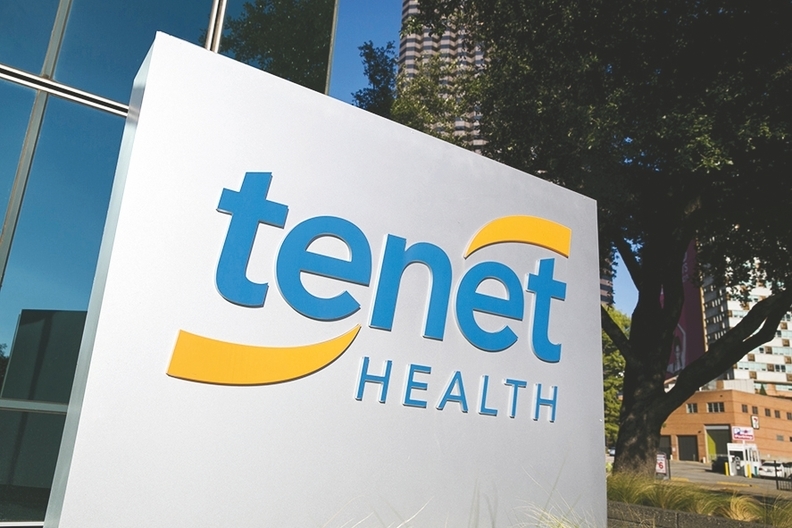 Tenet Healthcare Corp., Dallas, recorded a net loss of $230 million in the fourth quarter of 2017, up from $79 million at the same time in 2016. The Tax Cuts and Jobs Act dealt a major blow to Tenet's bottom line at the end of 2017. Under the law, Tenet recorded a $252 million write-down of its deferred tax assets and a $22 million increase in interest expense. Tenet also took on a $99 million after-tax charge related to the write-down of assets for sale in Chicago and employee severance. Tenet's net loss for 2017 was $704 million, compared with $192 million in 2016. Tenets results look better using adjusted earnings before interest, taxes, depreciation and amortization, which rose to $840 million in the fourth quarter of 2017, a 29% bump from $650 million in the prior year, and about $20 million above the high end of the company's outlook, Ron Rittenmeyer, Tenet's CEO, told investors in a call Tuesday morning. Tenet's net hospital operating revenue was nearly $4.2 billion in the fourth quarter of 2017, up 3.4% from the fourth quarter of 2016. Utilization statistics were mixed. Tenet's admissions were up 0.2% in the fourth quarter of 2017 compared with the fourth quarter of 2016. Over the entire course of 2017, however, admissions dropped by 2% compared with 2016. Some areas saw even larger drops: Outpatient surgeries, for example, were down 5.4% in 2017 compared with the prior year. Rittenmeyer pointed out that ambulatory cases increased 4.6% in the fourth quarter of 2017 compared with the same point in 2016, and revenue per case increased 2.2% during that time, which he attributed in part to strong imaging and urgent-care visit results from United Surgical Partners International. "Looking ahead, we have a robust pipeline and are in discussions with multiple health systems about additional opportunities in 2018 and beyond," he said. Emergency room visits were up 4.3% in the fourth quarter of 2017 compared with the fourth quarter of 2016, a trend Tenet spokesman Dan Waldmann said was partially flu-related. Overall in 2017, however, emergency room visits were down 0.7% compared with 2016. Tenet's total outpatient visits were down 2.6% in 2017. Despite the weak admissions figures, Tenet saw its revenue per admission spike 4.8% in the fourth quarter, which Waldmann said is skewed because it contains revenue from the California Provider Fee Program. He could not immediately provide a revenue per admission figure that excluded the provider fee. Eric Evans, Tenet's president of hospital operations, told investors on Tuesday's call that Tenet continues to see softer volumes than it would like, and said that's partly influenced by patients' enrollment in high-deductible health plans. He also said that the fertility rate has a negative effect on volumes. About seven of Tenet's hospitals are also working to raise their trauma levels, and the system has new neuroscience and stroke specialty centers coming online, Evans said. "So, again, raising the acuity of our facilities, being a provider of higher acuity services that we think often are a source, obviously, of those higher acuity surgeries," he said, "and then working closely with both teams to make sure that that stuff is transitioning in our markets, that we're able to earn that business no matter where the patient seeks it." It's revenue cycle subsidiary, Conifer, beat Tenet's expectations for revenue, though it declined 2% in the fourth quarter of 2017 compared with the fourth quarter of 2016, which Rittenmeyer told investors was primarily due to the company's divestitures. "While I expect us to tighten cost controls and improve execution, the acquisition of new business is the greater priority," he said. Tenet is considering selling Conifer and Rittenmeyer said the company has begun to secure the necessary nondisclosure agreements. He did not provide a specific timeline. Rittenmeyer told investors Tenet is working to develop a network of facilities that offer patients convenient access, including adding seven surgery centers in 2017. "These are less capital-intensive, directed to serve local communities close to the patient and provide outpatient care to complement the inpatient care provided by our hospitals," he said. In addition to adding access points, Tenet has launched a combined sales organization to be led by Bill Wilcox, CEO of United Surgical Partners International.